Facebook is working on developing a new feature that will connect users with top rated certified local businesses. Many are saying that Facebook is setting its first step in connecting business following Google and Amazon. It is expected that Facebook will develop its own counterpart of Yelp which specializes in businesses hosting and marketing. You can check the link https://web.facebook.com/services. When you open the services link, Facebook will showcase the Local businesses and organizations with the best Facebook reviews and ratings. The business encompasses plumbers, event managers and planners, doctors, spa, beauty and wellness, pet groomers, automotive, gardener, electrician and so on. For example, if you want DJ service in Kolkata, then select DJ from the list of Event planners. You will get a number of contacts of DJ starting from the ones with the best ratings om Facebook. It’s not yet clear how Facebook is rating the business services. 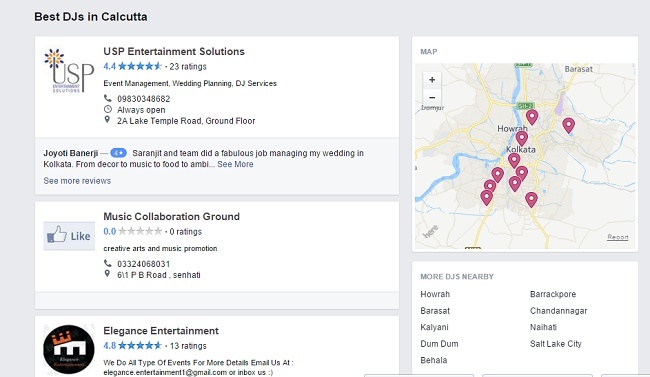 As per as reports are concerned, Facebook is collecting data based on nearby Places, data information by other logged-in users and the overall business rating by users. Earlier this month, Facebook revealed that had over 50 million active business Pages on its social network, which has raised from 40 million this April. A lot of new enhancements and improvements are needed in order to make this service more beneficial.